8926 ft (2721 m) . 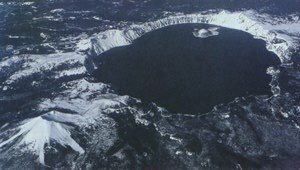 Crater Lake National Park is one of the wonders of the natural world. Once a large stratovolcano (known as Mount Mazama) reached a height of over 12000 feet (3700 m), but a massive eruption 7700 years ago destroyed the summit cone and emptied the magma chamber below, causing the entire mountain to collapse. 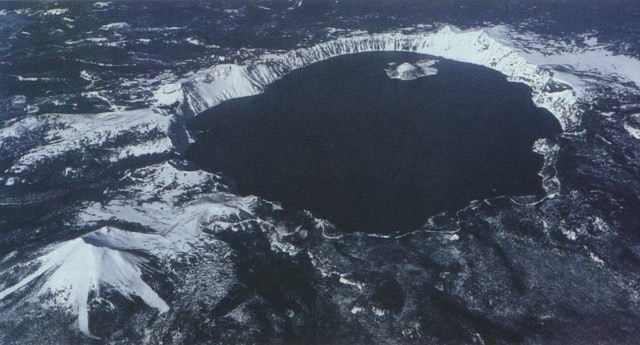 This formed the 6 mile (10 km) wide caldera which eventually filled with the brilliant blue waters of 1932 foot (589 m) deep Crater Lake, the deepest in the US. 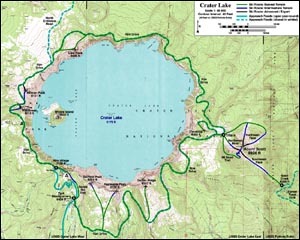 The lake surface now lies at 6178 feet (1883 m), with the surrounding rim varying from about 7000-8000 ft (2100-2400 m). Massive annual snowfall averaging over 530 inches (13 m) per year buries the area, making ski circumnavigations of the crater rim feasible in winter and spring. However, these deep snows also close Rim Drive well into summer, preventing easy vehicle access to ski mountaineering objectives such as Mount Scott, the highest surviving remnant of the original Mount Mazama. However, a number of other skiable high points on the crater rim remain easily accessible throughout the winter and spring. (50 km) The circumnavigation of the rim of Crater Lake is one of the classic cross-country ski routes in the US. The circuit follows the snow-covered Rim Drive, which generally stays within sight of the edge of the rim, except for a few sections on the south and east sides where it must detour far from the lake. The route is generally done in about 2-3 days, although cross-country racers have done it in less than 8 hours. Many parts of the road are difficult to follow when snow-covered, so this is definitely a backcountry tour. For the ski mountaineer, there are many steeper slopes dropping from the various high points along the rim which would provide enough good turns to make the loop worthwhile (as if the scenery alone wasn't enough!). 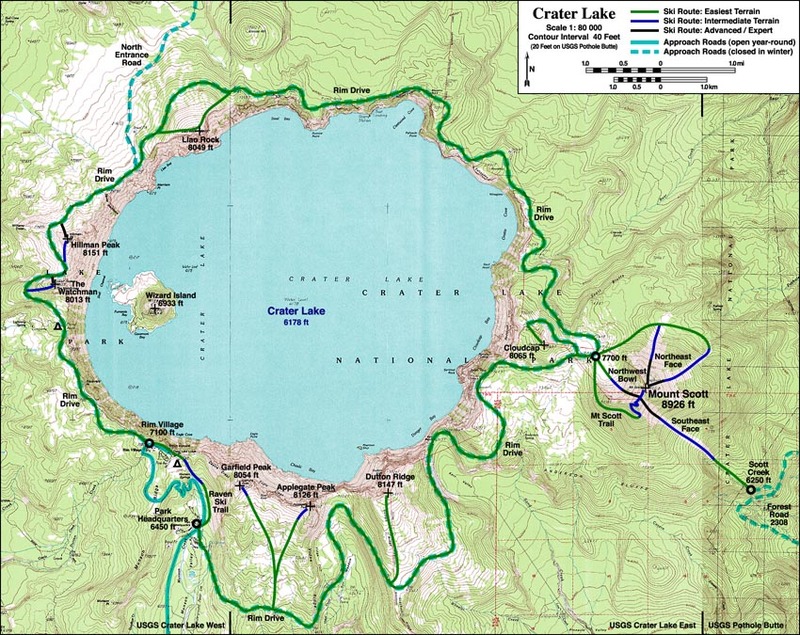 (14 km) Mount Scott is the most prominent high point in Crater Lake National Park, although it lies about 2 miles (3 km) east of the crater rim. It is a satellite cone of the original Mount Mazama, and survived largely unscathed due to its position east of the subterranean magma chamber. A large glacial cirque (which also predates the climactic eruption of Mazama) has been carved into the northwest side, exposing some of the solidified magma in the central conduits. This cirque makes an excellent albeit somewhat short ski descent, but due to its somewhat windward exposure tends to lose snowcover before summer (before the road opens to its base). The best option for good access and snow conditions is to go in spring as the plowing progresses, and drive as far as the Park Service will allow (usually to Kerr Notch). On the relatively smooth and uneroded north, east, and southeast sides, long treeless slide paths descend from the summit well into the forests below, providing somewhat longer ski runs with the penalty of reascent to return to the trailhead on Rim Drive. It may be possible to reach these routes from the Scott Creek and/or Pothole Creek drainages, which appear to offer very direct access. (12 km) These short and easy routes start from the Park Headquarters south of Rim Village and follow the snowcovered Rim Drive east. The broad snow slope leading to Garfield and Applegate peaks appears in only 1 mile, while the similarly gentle Dutton Ridge is about 5.5 miles up the road (after a short descent past Sun Notch). Stunning views of the lake can be found from all three high points and from the overlook at Sun Notch. (11 km) This route follows the snow-covered Rim Drive west from Rim Village, passing the Wizard Island Overlook in about 2.5 fairly flat miles. 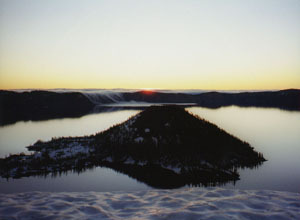 Hillman Peak is the highest point on the rim of Crater Lake, while the Watchman has a lookout cabin on its summit. Short ascents of about 800 ft (250 m) from Rim Drive lead to either summit, and steep slopes provide a short but sweet ski run, especially on the northwest side of each peak. These faces usually remain skiable after the park road opens, and the outlines of ski turns often linger in the snow well into midsummer.